Milan have never been a team to do anything half-baked, and if you’re going to go out of the Champions League, you may as well do it in style. And so last night, that’s exactly what they did. Even their disco jerseys screamed blinding fiery ball of metal crashing to the earth. No disrespect to Atleti, they played a fantastic game, and I wish them the best in their continued Champions League campaign and league campaign, too. But after such a fantastic match at the San Siro whose result did not reflect the match, this one was going to be crash and burn. Yes, Kaka, I agree. The Milan crest does not belong on that hideous third kit. Maybe the Disco Kits™ blinded our own players, but when Costa scored in the 3rd minute, it was obviously going to be a long night. 1-0 Atletico. To say that we defended on the night would be like saying that a sieve is watertight. Shrek left Costa completely unmarked, it was no fairy tale. But with two yellow cards in the next four minutes, it was clear that this game would not be pretty. First a card for Garcia for a foul on Balotelli, then a card for Rami for blocking Costa. Ouch. Like the first leg, it was brutal, but at least this time Milan dished it back, and no one got injured. We were nothing like the side we saw in the first leg. Our confidence was completely lacking, but then again, wearing those hideous jerseys was probably responsible for that. Everyone knows that when you don’t look the part, you can’t play the part. Either that or it was conceding that early goal. Or both. I don’t know, it was hard to see because of the jerseys. But from what I could see, we were not holding formation well or working together or really anything like we did before. Which begs the question: why those hideous jerseys? Or a more obscure question: why didn’t De Sciglio start? Or play at all? He was the highlight of a terrible match on Saturday, and is suspended this week against Parma. But seriously. Those jerseys did us in. The brutalization continued when, in the 17th minute, Balotelli’s free kick was seemingly blocked by Costa’s groin. But Balotelli would be fouled more than enough to compensate for that. In the 26th, we found out which Bonera would show up on the night. In the words of my commentator, “Bonera did well.” I’m not sure if that was like saying a child with disabilities did well or if it was a genuine compliment, but when Bonera is our best defender on the night, it’s not always a good thing. At least our Milan fans represented well early on, singing and chanting louder than the home crowd, even if four goals also cost them their match fitness. The good thing about the match came in the 27th when Poli’s beautiful cross to Kaka deflected ever so slightly off of Juanfran and past Courtois to wind up decisively in the back of the net. 1-1 all. 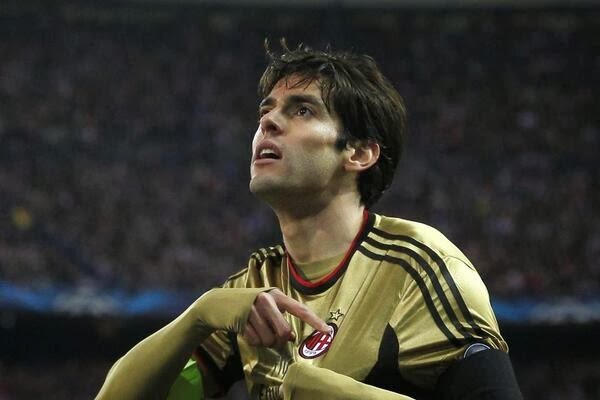 It was Kaka’s 30th Champions League goal, more than any other Brazilian. It was beautiful and gave the team a little bit of spark. Not that you could see the spark past those hideous Disco Kits™, mind you. But I was thrilled for Kaka. However, the tiny spark was quickly smothered by yet another Atleti goal in the 40th, when Turan’s shot was deflected harshly off of Rami. 2-1 Atletico. If Twitter is to be believed, the once hero Shrek is not just an ogre. 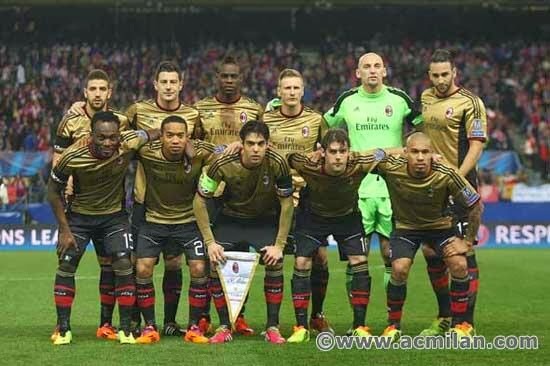 Now Milan were under siege, and losing their cool, too. In stoppage time at the half, Balotelli collected a yellow for dissent, something we haven’t seen him do for a while. He was probably just cursing about having to wear those horrific jerseys. Seedorf brought Robinho on for Taarabt at the half. I’m not sure who was more disappointing, to be honest. We kept up our ‘possession is 54% of the law but has nothing to do with the result’ gameplan and only managed 11 shots, five on target for the night. We completed 506 out of 640 passes, but Kaka’s goal was the only other thing we completed. We did beat Atletico on fouls, with 17 to their 10, and also on yellow cards, with four yellows to their one. Although I’m not sure if the cards were awarded for actual fouls and things so much as they were for those monstrous jerseys. Talk about crash and burn. Pazzini came on for Essien, but not even The Masked Wonder could salvage this game. Bonera’s yellow in the 70th for a handball was like watching a child try to get into the cookie jar while they knew mom was watching. And watching Garcia score from the resulting free kick was like watching that same mom let her child run out into the street in oncoming traffic. 3-1 Atletico. Not sure what was more painful at this point, the scoreline or being blinded for 70 minutes by those Disco Kits™. It got more painful, though. In the 73rd, Robinho’s shot hit the crossbar. One minute later, he earned himself a yellow for fouling Gabi. 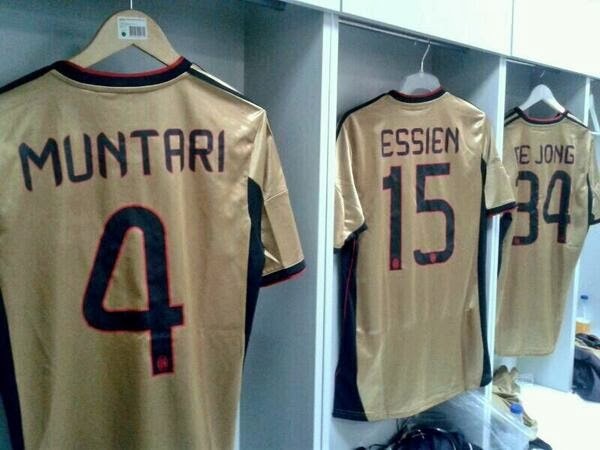 To add insult to injury, Seedorf sent Muntari on for De Jong, and Muntari forgot his lucky scoring boots, too. But the nail in the coffen was in the 85th when Costa beat our lethargic defenders to shoot and hit the post, bouncing in behind a helpless Abbiati. 4-1 Atletico. So much disco. Not enough fight. The truth is that we played poorly, Atleti played well, and this scoreline accurately reflects the performance. Those jerseys didn’t do anyone any favors, especially not my eyes, which are now permanently damaged. But we all knew it was a fool’s hope of any result for Milan yesterday, and we were right. So we crash and burn out of Champions League for now. When we will be back is hard to know, we have so much work to do to be at that level again. I’m not surprised, not even disappointed, honestly. But that doesn’t make it hurt any less. We crashed hard, and my eyes are still burning from those traumatizing kits. Maybe this will make Milan think harder about their third kits from now on.